POURED: A Lesson in D.I.Y. With the full support of the Mayor and City Hall, a group of skateboarders in northern Kentucky manage turning their guerrilla-style do-it-yourself, ramp-building project into the community's first public skatepark. The "Bridge" skatepark is located in Newport, Kentucky. Andrew Mack and Samuel T. Pennybacker completed Poured: A Lesson In D.I.Y. while attending the University of Cincinnati. They had only been classmates a time or two before the project but came together for the project at the beginning of their senior capstone video class. Unlike most of the rest of the class, neither of the two had a project lined up before attending the first class. Telling the story of the Bridge skatepark was the first idea Andrew shared with Sam and they decided to go with it. Both Andrew and Sam grew up skateboarding. They were also studying for a BFA in Electronic Media and finishing up in the Spring of 2014. The project was completed during the 10-15 week semester and premiered on campus in April 2014. *A portion of the proceeds will benefit Outreach for Animals, a non-profit 501c(3) organization whose mission is to educate people to respect wildlife and its natural habitat. Praised by critics as “One of the Best Films of the Year”, The Elephant in the Living Room takes viewers on a journey deep inside the controversial American subculture of raising the most dangerous animals in the world, as common household pets. 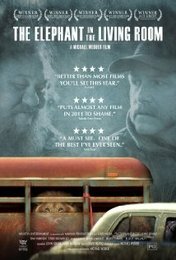 Set against the backdrop of a heated national debate, director Michael Webber chronicles the extraordinary story of two men at the heart of the issue – Tim Harrison, an Ohio police officer whose friend was killed by an exotic pet; and Terry Brumfield, a big-hearted man who struggles to raise two African lions that he loves like his own family. In the first of many unexpected twists, the lives of these two men collide when Terry’s male lion escapes its pen and is found attacking cars on a nearby highway. Winner of 5 Best Documentary Awards, the film courageously exposes the shocking reality behind the multi-billion dollar exotic pet industry with stunning photography, inspiring storytelling and unprecedented access into a world rarely seen, right in our own backyard. Awarded by The Humane Society of the United States, film director Michael Webber and Tim Harrison received the prestigious Genesis Award for bringing national awareness to the issue of captive wild animals. 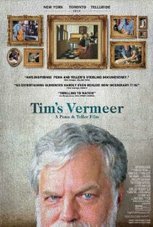 Tim began working with animals at the age of 16 as a veterinarian’s assistant. While volunteering at a local nature center, he assisted in the development of outreach programs and the rehabilitation of wild animals. Tim would soon become known as one of the best in the country, prompting zoos and wildlife facilities to hire him to raise and rehabilitate exotic animals. Passing at the top of his class in one of the most demanding and rigorous qualification courses in the country, Tim became a combination police officer, firefighter and paramedic for the city of Oakwood, Ohio. Due to his background in law enforcement and extensive knowledge of exotic wildlife, law enforcement agencies and animal control officers have called upon Tim to rescue wild and exotic animals in suburban settings. Tim has been consulted on national and state levels regarding his captures of and handling of wolves, cougars, exotic big cats and venomous snakes. Many of his exploits have been covered in local and national media, two books and an award winning documentary based on his work. In addition to his achievements with exotic animals and law enforcement, Tim is trained as a martial arts fighter, is a World Heavyweight Karate Champion and was awarded Lifetime Achievement Awards by both the International and US Martial Arts Hall of Fames. Tim also works for Homeland Security as an instructor for Disaster and Emergency Response at Texas A&M. He is a member of The Explorers Club and has traveled the globe with world-renowned nature filmmakers and wildlife authors. His travels include Asia, South America, Africa, Australia, Europe and North America where he has investigated and learned much about animals and their native environments. Tim is a published author and illustrator of three books, and has appeared on numerous television programs including FoxNews, Animal Planet, and the National Geographic Channel, advocating respect and proper behavior around wildlife. He currently lives with his family in Oakwood, Ohio, and is a 1975 graduate of Miami East in Troy and is the 2002 recipient of the Miami East Alumni Hall of Fame award. Tim Harrison was also awarded the Guardian Angel Award for his tireless efforts to make this world better for exotic animals. Tim Harrison is the Director of Outreach for Animals, a non-profit 501(c)(3) organization whose mission is to educate people to respect wildlife and its natural habitat. Over the years, their message has reached millions of people through all forms of media and outreach programs. Their goal is to continue to be the number one advocate for proper behavior around wildlife by bringing greater understanding of wildlife to the general public through a national presence with lectures, programs, educational materials, and experience. OFR is committed to always be the goodwill ambassador and liaison between humans and animals. They are a for-impact organization that saves lives, transforms lives and changes lives. Outreach for Animals is solely funded by donations from supporters like yourself. Their volunteer mission would be impossible without your help. Please consider making a tax deductible donation today in order to improve the life of an animal tomorrow. Click Here to Give. I can remember my father telling me the story of Johnny Sylvester and Babe Ruth when I was a child. Babe Ruth promised to hit a home run for an ailing boy named Johnny Sylvester during the 1926 World Series. The Babe later visited Johnny at his bedside in Essex Fells, New Jersey to cheer him up. From this charmed sequence of events, a legendary story was born. This story has often been debated and romanticized in baseball lore. Hollywood has even portrayed it (although inaccurately) in several films including ‘The Babe Ruth Story’ starring William Bendix and ‘The Babe’ starring John Goodman. But the story itself never needed any embellishments. Johnny Sylvester was my father’s uncle, and I had the pleasure of meeting and visiting him when I was a kid. My documentary will shed light on the mystique of the 1926 World Series, and tell how a promise became a legend. ‘I’ll Knock a Homer for You: The Timeless Story of Johnny Sylvester and Babe Ruth’ won the Award for ‘Home Grown Documentary Feature’ at the 2013 Garden State Film Festival. Tickets: All Seats $10 | Advance tickets may be purchase through BrownPaperTickets.com. Winner of more than 25 awards, The Vision of Paolo Soleri: Prophet in the Desert is a biographical documentary on the architect and environmentalist Paolo Soleri. It is the story of an unprecedented artistic quest. Born in Torino, Italy in 1919, Soleri came to America in 1946 to mentor under Frank Lloyd Wright at Taliesin West, Arizona. After one and a half years, Soleri left Wright to embark on a blazing original course of his own. While uncovering Soleri's legacy as an architect, environmentalist, and philosopher, the film will pose critical questions about mankind's future, and architecture in a world facing environmental, social, and economic crisis. Few architects have proposed more ambitious design, and been less prone to compromise. "Ultimately, the cities that we build are like pianos and people are the music. Without good compositions and skilled musicians, the piano is useless." In a time when America’s economy and sense of community were crumbling, one guy left everything behind – to see if he could survive solely on the support of the 21st century’s new town square: Craigslist. Let's do it again... like the FIRST time! 8PM - Movie and Drawing for Door Prizes! MIDNIGHT - Costume Contest and Door Prizes! On May 20th, 2013 an EF5 tornado ripped through Moore, OK. The magnitude of devastation measured over eight times greater than the atomic bomb that leveled Hiroshima. As the world watched, one question continued to surface... Where Was God? This story follows several survivors, parents, children, first responders and volunteers who recount the timeline of destruction and share their experiences of the devastating and miraculous events that changed their lives forever. Where Was God? is not rated by the Motion Picture Association of America. While the film does not contain any adult language, sexual content, or violence; Where Was God? is a detailed non-fictional account of a great tragedy. The themes of death, mortality, and grief are present in the film. We advise parents to use their best judgement when deciding whether or not this film may be appropriate for their children. Ralph Steadman is the last of the original Gonzo visionaries. 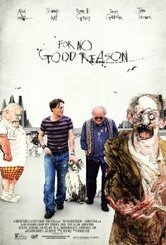 Made over the course of fifteen years, For No Good Reason explores the connection between life and art through the eyes of seminal British artist, Ralph Steadman. Insightful, humorous, and visually stunning, this is a study in honesty, friendship and the ambition that drives an artist. Ralph's rise to prominence began in the early 1970's during the fallout from the love and hope that had swept the western world during the 1960's. This legendary time for music, literature, art and philosophy was the catalyst, along with his developing relationship with writer Hunter S Thompson, for Ralph to express and chart the wreckage that followed; a large-scale disintegration of a demoralized counter-culture. His art gained recognition in the press and popular-culture publications, both in the U.K. and U.S., for its bold comment on his fiercely heart-felt politics. The film is a richly creative, visual feast about the power and importance of art to achieve Steadman's aim "I learnt to draw...to try to change the world." Director Charlie Paul spent 15 years meticulously amassing the footage and creating the remarkable animations for the film to match the same anarchic energy, anger and free spirit of Steadman's pictures. Through Johnny Depp's lead in this intimate portrait, we are able to reach to the heart of what make this artist tick, his friendships and fallings out, his love for art and his passion for civil liberties. For No Good Reason is riot of stories and images as we take a trip through the wild and dark days of Steadman's time with Fear & Loathing in Las Vegas writer Hunter S Thompson, the Rumble in the Jungle; gun fights with literary giant William S Burroughs and his fiercely heart-felt politics.This is an inventive, energetic, occasionally harrowing, but inspiring and uplifting film with contributions from Terry Gilliam, Richard E. Grant and music from Slash, All American Rejects, Jason Mraz, James Blake, Ed Harcourt and Crystal Castles, all For No Good Reason. A documentary film about the impact of the best comic strip in the history of the universe: Calvin & Hobbes. It has now been nearly two decades since the end of the Calvin & Hobbes era. Bill Watterson has kept an extremely low profile during this time, living a very private life outside of Cleveland, Ohio. Despite his quiet lifestyle, Mr. Watterson is remembered and appreciated daily by fans who still enjoy his amazing collection of work. This film is not a quest to find Bill Watterson, or to invade his privacy. It is an exploration to discover why his 'simple' comic strip made such an impact on so many readers in the 80s and 90s, and why it still means so much to us today. Middle class housewife Ila is trying once again to add some spice to her marriage, this time through her cooking. She desperately hopes that this new recipe will finally arouse some kind of reaction from her neglectful husband. She prepares a special lunchbox to be delivered to him at work, but, unbeknownst to her, it is mistakenly delivered to another office worker, Saajan, a lonely man on the verge of retirement. Curious about the lack of reaction from her husband, Ila puts a little note in the following day's lunchbox, in the hopes of getting to the bottom of the mystery. This begins a series of lunchbox notes between Saajan and Ila, and the mere comfort of communicating with a stranger anonymously soon evolves into an unexpected friendship. Gradually, their notes become little confessions about their loneliness, memories, regrets, fears, and even small joys. They each discover a new sense of self and find an anchor to hold on to in the big city of Mumbai that so often crushes hopes and dreams. Still strangers physically, Ila and Saajan become lost in a virtual relationship that could jeopardize both their realities. Bitten by the ‘Moonbug’, photographer Steve Pyke set out on a journey across America in his search to meet and photograph the Apollo space pioneers. A journey in which he was to meet the adventurers, risk takers and dreamers who were behind one of the most historic endeavors of our time. From living rooms, and moonscape deserts, to Cape Canaveral, Steve captures these men in frank, revealing portraits, while unravelling their very personal and divergent memories. Documented by filmmaker Nichola Bruce with rare archive footage and an original score by Matt Johnson (The The), Moonbug is both a photographic road trip and an exploration of how photographs become signposts for history." Over the course of three nights at Hollywood's Pantages Theater in December 1983, filmmaker Jonathan Demme joined creative forces with cinematographer Jordan Cronenweth and Talking Heads... and miracles occurred. Following a staging concept by singer-guitarist David Byrne, this euphoric concert film transcends that all-too-limited genre to become the greatest film of its kind. A guaranteed cure for anyone's blues, it's a celebration of music that never grows old, fueled by the polyrhythmic pop-funk precision that was a Talking Heads trademark, and lit from within by the geeky supernova that is David Byrne. 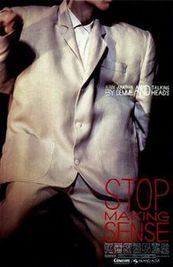 Rolling Stone magazine hails Stop Making Sense as the, "Greatest concert movie ever..."
Johnny Depp pays a call on his friend and hero Ralph Steadman and we take off on a high-spirited, lyrical, raging and soulful journey discovering the life and works of one of the most important radical British artists of modern times. Steadman rose to prominence in the early '70s when his impassioned and stirring images gained recognition through popular cultural publications and press both in the UK and US for their bold comment on world politics and human rights infringements. "For No Good Reason" is a richly creative, visual feast of a film about the power and importance of art to achieve Steadman's aim "I learnt to draw...to try to change the world." Director Charlie Paul spent 15 years meticulously amassing the footage and creating the remarkable animations for the film to match the same anarchic energy, anger and free spirit of Steadman's pictures. It is riot of stories and images that literally blast out of the screen as we take a trip through the wild and dark days of Steadman’s time and consignments with "Fear & Loathing in Las Vegas" writer Hunter S. Thompson, the Rumble in the Jungle, gun fights with literary giant William S. Burroughs and his fiercely heart-felt politics. Through Depp's lead in this intimate portrait, we are able to reach to the heart of what make this artist tick, his friendships and fallings out, his love for art and passion for civil liberties. This is an inventive, energetic, occasionally harrowing but inspiring and uplifting film with contributions from Terry Gilliam, Richard E. Grant and music from Slash, All American Rejects, Jason Mraz, James Blake, Ed Harcourt and Crystal Castles, all "For No Good Reason." There was a time, as recently as the 1980s, when storefronts, murals, banners, barn signs, billboards, and even street signs were all hand-lettered with brush and paint. But like many skilled trades, the sign industry has been overrun by the techno-fueled promise of quicker and cheaper. The resulting proliferation of computer-designed, die-cut vinyl lettering, and inkjet printers has ushered a creeping sameness into our landscape. 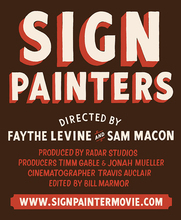 Fortunately, there is a growing trend to seek out traditional sign painters and a renaissance in the trade. 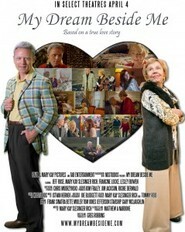 My Dream Beside Me is a romantic dramedy based on the true love story of Paul Rich and Mary Kay Slesinger Rich. At 84 years young Paul lost his wife of 66 years - Mary Kay was married for 34 years and she was left a widow when she was in her mid 60's. After a few years Paul and Mary Kay met and fell in love. This union of marriage is a testimony that people can be strong, vital and full of life at any age. Based on the book, You're It, by May Kay Slesigner Rich. From the director of WORDPLAY and I.O.U.S.A. comes a captivating look at a radically innovative approach to education. IF YOU BUILD IT follows designer-activists Emily Pilloton and Matthew Miller to rural Bertie County, the poorest in North Carolina, where they work with local high school students to help transform both their community and their lives. Living on credit and grant money and fighting a change-resistant school board, Pilloton and Miller lead their students through a year-long, full-scale design and build project that does much more than just teach basic construction skills: it shows ten teenagers the power of design-thinking to re-invent not just their town but their own sense of what's possible. 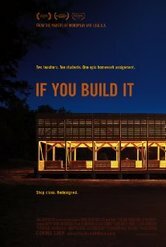 IF YOU BUILD IT offers a compelling and hopeful vision for a new kind of classroom in which students learn the tools to design their own futures. Tim Jenison, a Texas based inventor, attempts to solve one of the greatest mysteries in all art: How did 17th century Dutch Master Johannes Vermeer ("Girl with a Pearl Earring") manage to paint so photo-realistically -- 150 years before the invention of photography? The epic research project Jenison embarks on to test his theory is as extraordinary as what he discovers.